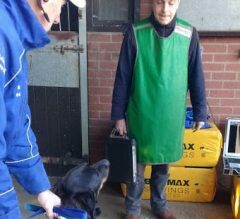 The purpose of Dr. Mike Shepherd's visit to George Margarson's training yard in Newmarket, England was mostly to do follow-up radiographs on a filly recovering from a lameness. Before he packed up his lead aprons and machinery, however, Margarson brought out another patient for Shepherd. 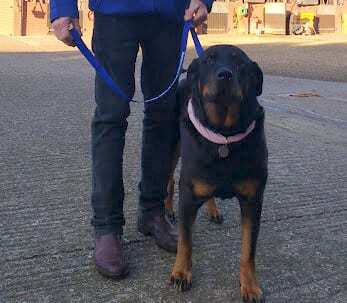 Margarson, 65, and his family have long made a practice of taking in senior rescue dogs from nearby Battersea Dogs and Cats Home. The family lives in a house attached to Graham Lodge Stables, where Margarson keeps 52 stalls, enabling them to give the time and care special needs dogs may require. Admittedly, Margarson said it's tough to become attached to dogs who only have a few years left, but the emotional sacrifice for her is worth it. “I'd rather they have a nice finish to life here than sitting in a dog's home. I feel far more bad when we go and visit them and leave the old ones there,” she said. Recently, the family took in Roxy, a happy, wiggly Rottweiler believed to be “fairly elderly,” but exact age uncertain. She came with an unknown history and a sizable lump on one elbow, which causes her to limp but does not slow her down. “She's been quite lame but she's also leaping around like an idiot, jumping up at me, so she can't be that uncomfortable, you know what I mean?” said Margarson. The Margarsons had been worried about whether the lump could be a tumor, so Shepherd agreed to take a look on radiograph. Part of adopting older dogs is knowing when to let go, and providing a humane, peaceful end is just as important to the family as giving the dogs a comfortable, happy life. A tumor in an elderly dog would not be surprising, and the animal likely wouldn't have a great prognosis. Roxy is one of three dogs in the Margarsons' pack, alongside another Rottweiler and a greyhound. The actual procedure of shooting the radiographs takes three people to gently hold Roxy and her elbow in the right position, mostly because she's so excited to socialize with her visitors. To everyone's relief, Shepherd's images show the lump is bone-related, not tumor, and Roxy has arthritis, which can be managed. “She's part of the fixtures here, bless her,” said Katie Margarson. George Margarson has horses to send to the gallops, so he has to get back to work fairly soon after the x-rays and doesn't say much about the result. But as he heads back around to the center of the yard with his dog at his side, there's a twinkle in his eye. Roxy's not going anywhere any time soon. This entry was posted in Barn Buddies, NL Article and tagged barn buddies, George Margarson, Katie Margarson, Natalie Voss, Newmarket by Natalie Voss. Bookmark the permalink.